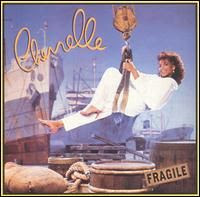 Cherrelle, a Detroit R&B singer had a huge string of hits throughout the 80's and 90's. This tune is a great blend of soul, pop and electro, a few years before it became the sound of the late 80's. This tune was covered by Robert Palmer in 1985 and Mariah Carey in 2001. So I just got back from a short weekend trip to New York, it wasn't all fun and games, there was a lot of carrying boxes and ferrying things about involved, but happily by coincidence as much as design my visit happened to fall on the weekend of CMJ. I saw one show (friends of friends Tiger City alongside Walter Meego) then blew the rest of it off to go record shopping in the little spare time that I had. Whilst my companion was shopping for organic jeans in a next door boutique I stopped in at A1 records (439 E 6TH St), I had the best luck here over the handful of other stores I stopped in during the course of the afternoon. 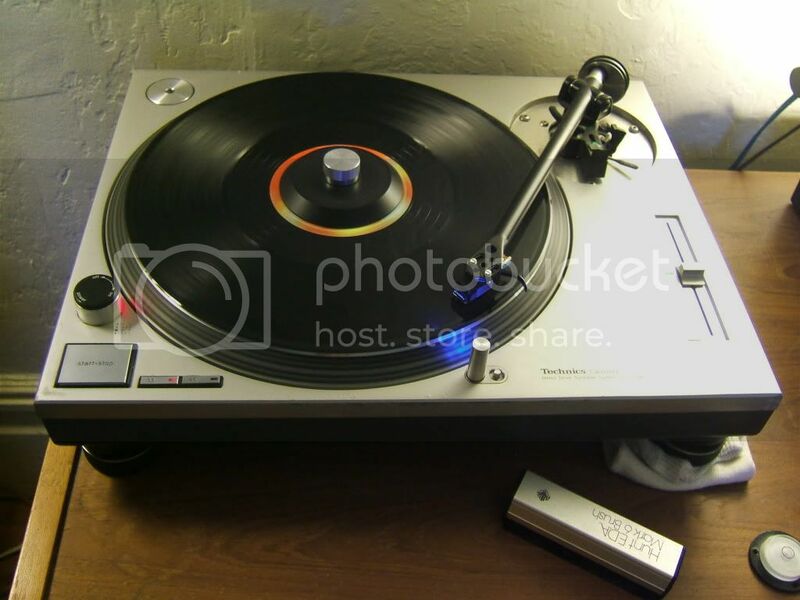 They carry a lot of heat, records being sorted by genre then by label and vinyl condition being taken heavily into account in pricing which I like. My two favorite scores there were a perfect copy of Tantra's 'Hills Of Katmandu' for $10, and an ok first issue copy of Gwen Guthrie's Padlock lp for $6. B.T. Express was an important funk disco group that had a few hits in the 70's. Their biggest single was Do It (Till You're Satisfied) which hit #2 on the Billboard Hot 100 in 1974. Their sound throughout the 70's threw a deep and groovy vibe. In 1980 they created an album that reflected a new era. 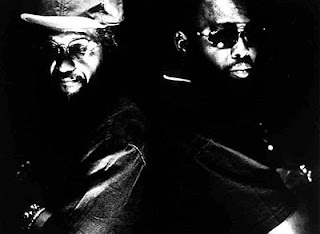 They were on a quest to bring the world the future of boogie. That album was 1980 and it featured a jacket with the B.T Express spaceship on the front. The grooves are very polished and upbeat. 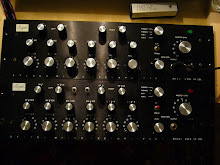 The album is also loaded with tight production, synthesizers, and spacey electronic sounds. Their single from the album was Give Up The Funk (Let's Dance), but it doesn't really reflect the direction they were taking as much as the track Takin' Off. My apologies that this was ripped from a well loved copy of the album. 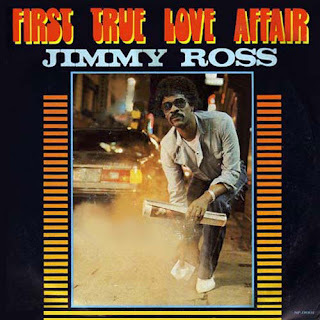 As far as I know Jimmy Ross only cut one LP in 1981 and put out a few 12 inches with the aid of Italian superproducers Stefano Pulga and Luciano Ninzatti (Kano). Very little else is known about the man except that he passed into soul heaven in the year 2000 and he most certainly made a couple of the heaviest early 80's disco cuts ever released. mp3: "Fall into a Trance"
mp3: "First True Love Affair"
At my work I am constantly tortured with break-beat acoustic music, and have to run to my office to cleanse myself. I often times use this beautiful track to put myself into a good mood. Mr. Flagio is a group from Italy that produced a couple of incredible italo tracks in the 80's. They had an amazing modern sound that sounds fresh to this day. 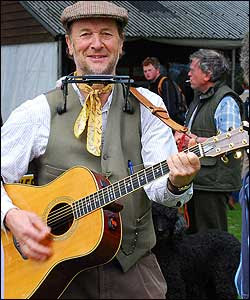 I'm not from San Francisco, I'm from Sheringham in North Norfolk, England. Several cultural centres are located near the Victorian era seaside town of Sheringham, these include Norwich (the epicentre of the region), Kings Lynn and North Walsham. A common preconception that I hear when talking to other dance music historians and urban culture historians that I encounter on my travels throughout the world is that no disco, rare groove, electro soul or boogie of any note whatsoever ever came out Norwich and its surrounding areas. Sadly, after much time and study of the subject it would appear they were right. Norwich was more of a post punk art school town in those days, a genre in which it punched slightly above it's weight (lightweight), but I still ask around and look through the local record bins when I'am back, in hopes that I will find something by Norfolk's one forgotten underground electro disco act that disbanded unheralded in 1983, leaving it's members disolusioned and heading back to the pig farms or mustard factory never to speak of their failed efforts again. Yet, where Norwich was lagging other parts of the United Kingdom had plenty to offer. 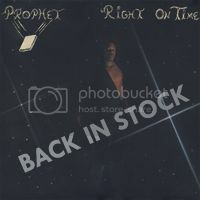 Britain has always done a lot with black American music, boogie was no exception and the 12" electronic soul and disco singles that came out of early eighties London fetch fair whack now, probably due to the low number of pressings as compared to their US counterparts and subsequent relative rarity, plus they are mostly good. 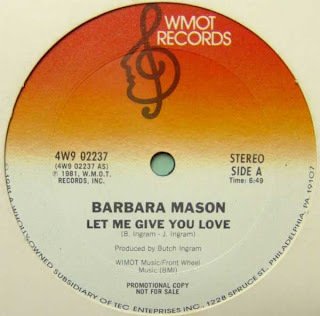 Barbara Mason is another 60's soul diva that continued to put out great albums through the 70's. 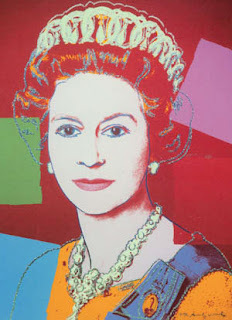 Yes, I'm Ready was her break out hit in 1965. Her soul tracks are incredible, including Don't I Ever Cross Your Mind. Let Me Give You Love is a track from 1981 that shows some great soul, disco, and cutesier italo elements. It is a happy soul tune with a mellow delivery. It has some horns up front that sound like they could be borrowed from Madness, coupled with a playful cowbell, funky bass line, and fuzzy bass synth line. The strings and Barbara's sweet voice meet to bring the track a smooth late light party vibe. 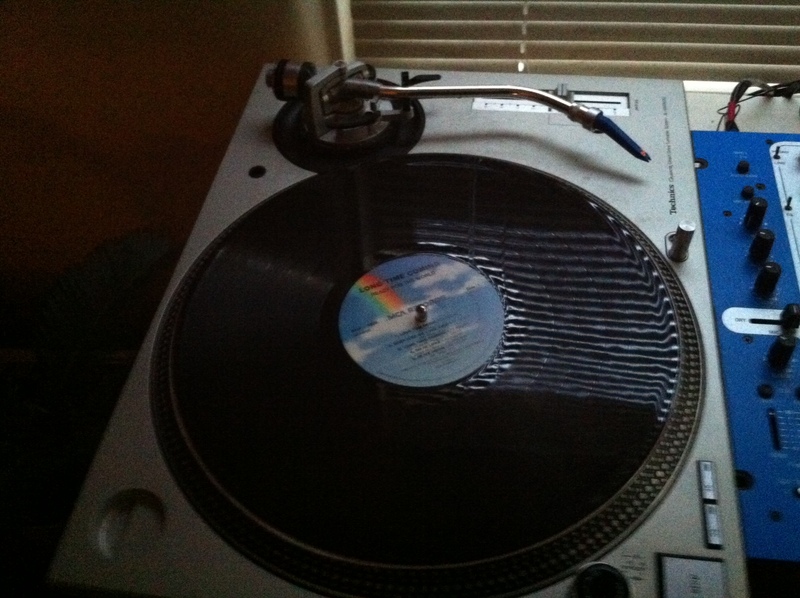 Hot Summer Nights by Love Club is now one copy rarer. This isn't going to be a long post as I'm a little cut up and this was never meant to be a livejournal styled teenage blog of emotional outpouring, it was supposed to be about free mp3's of old and rare underground dance records. Well I think Hot Summer Nights by Love Club is getting rarer by the minute as my copy is smashed right through the middle and now will be retired to Levan's record crate in the sky where all good boogie records go when they die. Here is an mp3, it doesn't come in a west end records sleeve but then its not shattered into pieces either so its better than nothing. If you see this come up on eBay over the next few weeks, do me a favor, lay off, I'm broken hearted and need this back in my bag. I usually don't enjoy spoken dialogue in dance tracks, it is almost without question an unnecessary addition to any vocal line, especially in the case of disco where the monologue usually consists of some diva complaining about how some man has done her wrong. If I were to edit a track this section of any intro would be the first to get the chop..except in the instance of Class Action's Weekend, in which case everything else would go and I would just repeat the spoken word bit over and over because its ace. "Well well well, look who's home. I didn't think you were going to make it tonight my man.." and so on it goes. Minimal boogie synth disco hybrid with the best soul sister vocal in the history of the genre. 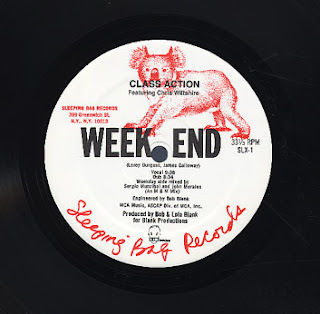 With Larry Levan on the mixing boards it achieved No.9 position on the Billboard Club Play Singles chart in 1983. Pure heat.